ABUS 401 / 130 HB 140 Mini U lock is an upgraded version of the identical looking 40 series mini U locks. Internal and material changes bumped this lock up to security level 13 (40 series are level 10). This U lock has a 14mm* special steel hardened shackle and double deadbolt locking mechanism operated by a floating disc key system. 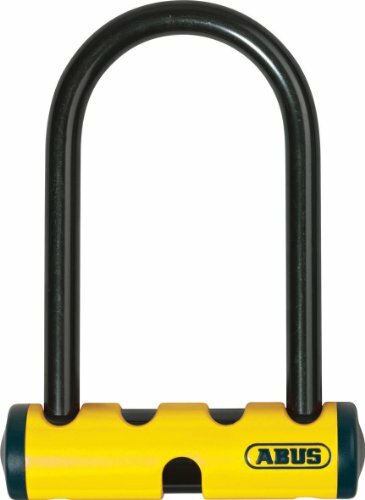 * On some websites you will see this lock advertised with a 16mm shackle. This is NOT true. 16mm refers to the shackle including rubber protective cover. This lock has a 14mm gauge steel shackle. The main difference between the 40 and 401 series Abus U locks and 51, 54, 64 series is that this lock is not manufactured in Germany. There is also no replacement key service offered at this time.